Illusions, Parisian styled boutique in Mount Lawley was originally a lovely home build a 100 years ago! It now combines an eclectic mix of Vintage Hair and Makeup designing, with Luxury Hi – Afternoon Tea. 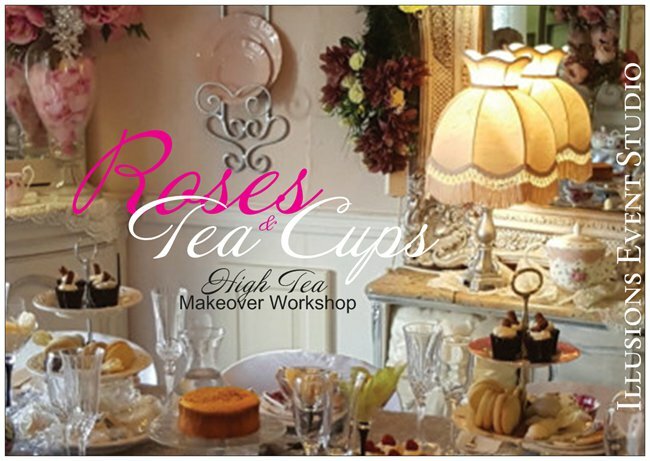 Has a wonderful light airy feel, high ceilings and chandeliers, beautiful mirrors, lamps and accessories, elegant vintage tea pots of yesteryear, porcelain and luxe crystal table ware a little of Downton Abby – fantastic location is perfect for the Best Girls Day Out Makeover party! Guest will learn how to colour match their foundation, choose the right texture and to achieve a more youthful and flawless finish. - “Fabulous Xmas gift idea” A fun-filled outing for you and Mum, or enjoy with a group of girlfriends and or while the little darlings are at school work colleagues, hen’s, birthday, mothers days and more……. Sessions 2 1/2 hour booking. Illusions Boutique Studio is close to the CBD, ideally located on the Beaufort Street Strip, ( No 745) Mt Lawley, with gorgeous ‘Modern’ Vintage Style presentation.